Search Engine Optimization (SEO) is not something you do, anyone who claims to have 'a SEO expert' has no real understanding of what Search Engine Optimization really is or how it works. SEO is a combination of how a website is built, the content of a website, the number of websites that link TO a website, the ammount of Social Networking associated with the website and much more. One single person cannot manage all of this, it requires a TEAM of Experts working together to design, build, optimize, integrate Social Networking and produce the best results for a true search engine optimized website. If your website is not ranked high enough on the search engines ( after the 2nd page of the search results) you will be automatically excluded by potential customers. The nationally recognized Search Engine Optimization (SEO) Experts of Builder Consulting are the best in the business. Through Internet Builder Consulting Search Engine Optimization client websites are properly optimized, submitted, and monitored to achieve maximum ranking in the top search engines on an ongoing basis. Search Engine Optimization is the ongoing method of building, optimizing and marketing a website to improve a website's ranking on search engines. The Internet Builder Consulting Search Engine Optimization Experts have nearly two decades of proven RESULTS for clients nationwide with first page rankings for nearly every website. Every website built incorporates the proven search engine optimization techniques developed to rank your website higher on Google, Yahoo, MSN, Facebook GraphSearch and all other search engines. 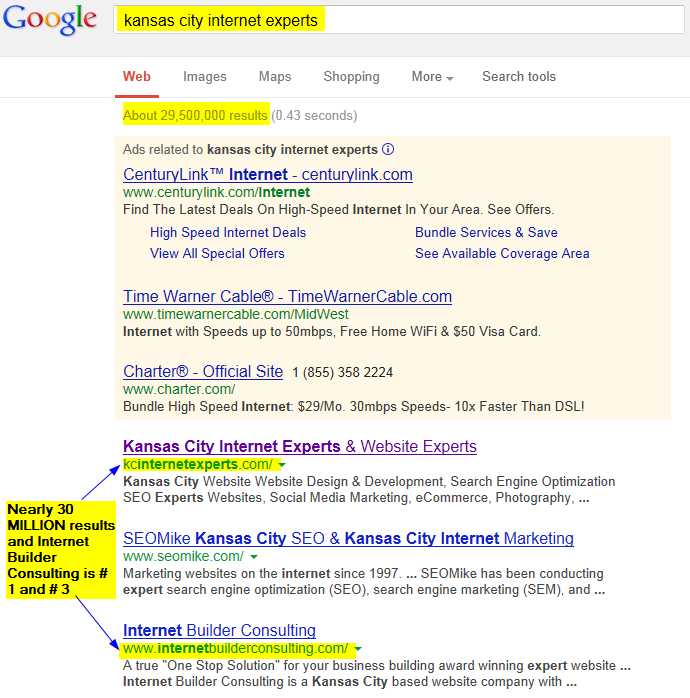 The example below is a highly competative search term with nearly 30 MILLION search results listed where the Search Engine Optimization Experts at Internet Builder Consulting produced 2 of the top 3 highest ranking websites (KCInternetExperts.com and InternetBuilderConsulting.com)! Search engine marketing combines paid listings (pay per click), search engine optimization and ongoing additions or changes to a website to achieve top rankings in the major search engines. Google, Yahoo!, Bing, Facebook GraphSearch, and Ask each have unique directories of content with different ranking criteria.